Garden sheds are the perfect solution to a wide range of backyard clutter. Whatever your lifestyle, hobbies, or storage needs, Trade Tested garden sheds will fit your needs. What Can You Store in Your Garden Shed? 1) Children's bicycles, scooters, the family moped. Protect your bicycles, electric scooter or family moped from the elements and theft by storing them away in one of our Shed Master garden sheds. 2) Outdoor games and sporting equipment. Let's face it, children's sports equipment, such as balls, bats, nets, and other gear can pile up pretty quickly. Outdoor garden sheds provide the perfect place to safely and conveniently tuck these items away in between use. 3) Landscaping tools can be organized and safely stored in your new garden shed. If you take care of your own yard, you've probably invested quite a bit of money into your gardening tools and equipment. Garden sheds not only protect your tools from the elements, but from theft as well. You'll also be able to store gasoline, fertilizers, and other chemicals that you'll want to lock away from younger family members. 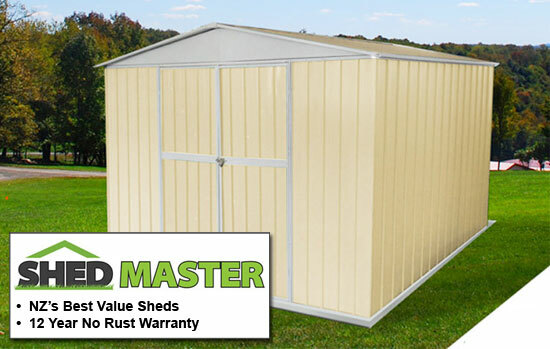 4) We carry a variety of garden sheds, that range in size from 1.75m all the way up to 4.3m. Our larger garden sheds provide enough storage space to organize an entire workshop full of tools. Is engine repair one of your hobbies? Maybe you enjoy woodworking. Whatever your hobby, our larger garden sheds can hold storage shelves of equipment for ease of organisation. No longer will you have to search for your power tools or favourite set of socket wrenches. Everything can be conveniently organised in our Shed Master garden sheds. Whatever your family lifestyle or storage needs are, Trade Tested is your outdoor garden shed supplier.